Save tons of money and create stylish bedrooms for your kids with help from American Freight Furniture and Mattress. You can shop by color and finish or take size, style, and storage into account. Choose a traditional spring mattress or memory foam mattress to complete your child’s bed set. In this post, we’re going to highlight all the different kids’ beds available at American Freight. We’ll help you find the bed frame that fits your space and needs. Plus, we’ll offer our top picks for twin and full mattresses. Let’s get started! If you’re on a mission to find a cheap bed for kids, visit your local American Freight today. Whether it’s your child’s first big kid bed or they’re upgrading from twin to full, we have plenty of frames to choose from! 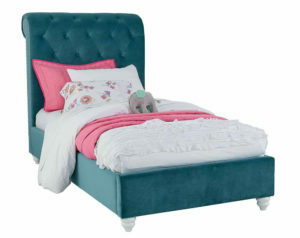 Check out the Gabby Teal Bed. The teal velvet upholstered headboard features a diamond tufted pattern that’s classy and cozy. The bed comes in twin and full sizes. The bed frame rests on white bed bun feet. The beautiful chrome nailhead trim detailing around the headboard looks high-end without the price tag. 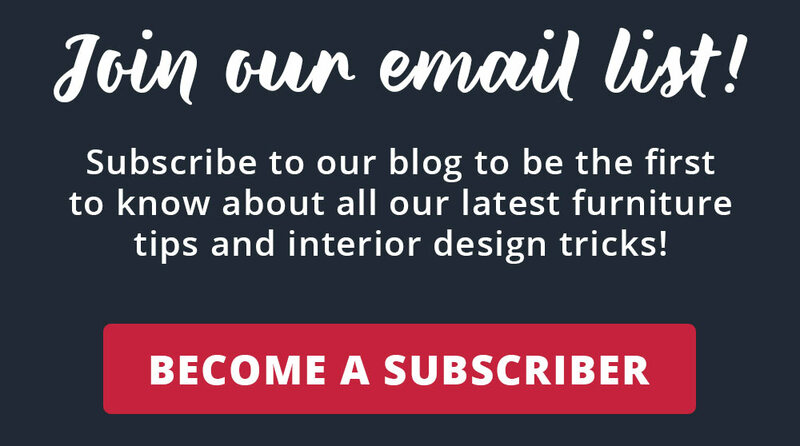 Read more about trendy nailhead trim here. 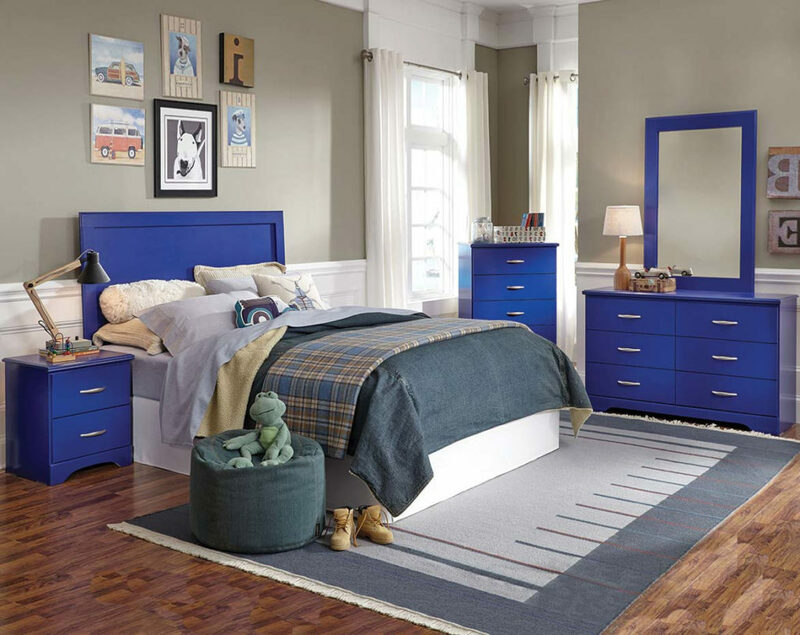 We also love the Leo Blue Bedroom Set. The 3 Piece Set includes the headboard, dresser, and mirror for only $349. Upgrade to the full 5 Piece Set by adding the chest and nightstand for an additional cost. This twin set is also available in full and queen. Would you prefer it to be pink? If so, check out the True Love Pink Bedroom Set. Let your children express themselves with bold and bright new beds. 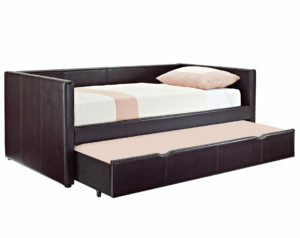 The Fantasia Pink Bed has a simple pink frame and headboard combo. The bed is soft and padded, which makes it ideal for kids. Best of all, all of the surfaces easily wipe clean with a soft cloth. This bed is available in twin and full sizes. The Avery Pink Corner Trundle Bed is another top pink pick. The tufted pink velvet is adorned on the headboards and the footboard. Under the twin-sized bed, a huge storage drawer pulls out. We love to use this space to store extra bedding like pillows and blankets. Hey kids! You can even put your favorite toys in the drawer! Click here to see more beds for kids at American Freight Furniture and Mattress. Do your kids share a room? Do you need an affordable bed with storage space? 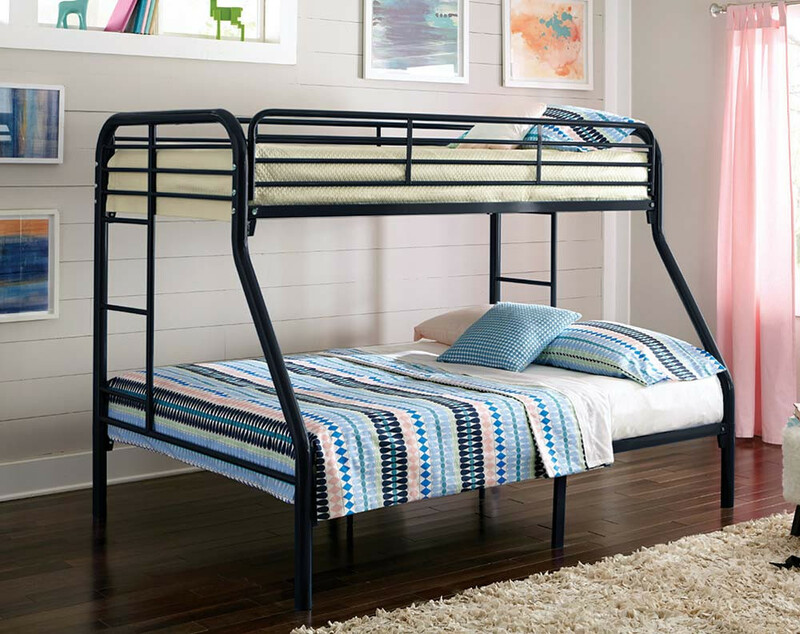 Are you searching for durable bunk beds for kids? If you answered ‘yes’ to any of these questions, we can help! It’s easier than you may think to choose the right bed for your kids. For kids that share a bedroom, bunk beds make the perfect space-saving option. 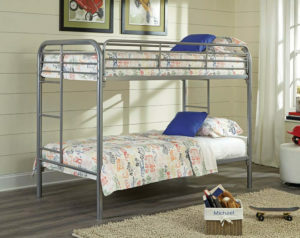 If your kids are close in age and height, choose a traditional bunk bed like the Twin Over Twin Silver Metal Bunk Bed. The simple metal frame is easy to pair with any kids bedroom theme. Click here to shop for the same bed in black. To get the most out of your space, the Chocolate Heartland Reversible Staircase Twin Over Twin Bunk Bed may be your best bet. Not only does the bed feature two standard twin-size beds, but there is a third twin bed tucked under the bottom bunk. Simply pull out the bed when you’re ready to use it. Plus, the staircase is reversible. The built-in drawers in the staircase are perfect for storing pajamas linens. You’ll love how easy it is to fit this bed in any room in your home. Trundle beds are great for spare bedrooms or kids who have lots of sleepovers. The New York Black Trundle Bed features storage drawers under the twin or full bed options. Tuck clothes or toys in the drawer to keep them out of sight in a small bedroom. The Lindsey Daybed With Trundle is a stylish bed addition to any bedroom. We love to stage this piece with big throw pillows during the day. At night, convert the top bed into a traditional twin and pull out the bottom mattress for additional sleep space. To shop for more bunk beds for kids, day beds, and storage beds, visit your local American Freight Furniture and Mattress. Traditional platform beds are a great option for kids of all ages. Whether you choose a bed with short or tall bed bun feet, you can always rely on a little under bed storage. Plus, most platform beds come with a stylish headboard. Click here to see our variety of platform beds. You’ve got lots of options for materials when you shop for affordable kids beds. Our wood, metal, velvet, and faux-leather beds can help you add personality to any kids room without breaking the bank. You can’t go wrong with the simple and timeless design of a metal bed. We love standard styles like the Tristen Metal Bed. To maximize your space, choose the Twin Over Full Black Metal Bunk Bed. This bed is a great option for kids as they grow! Your son or daughter will love climbing up to the top bunk while they’re young. However, when they need more space, they can move down to the bottom bunk. Metal is also super easy to pair with bedroom decor. Colorful desks, dressers, and nightstands match perfectly with metal beds. Create a warm and cozy kids room with a wood bed frame. The Honey Pine Heartland Mission Captain’s Bed With Trundle is perfect for young kids. The twin-size bed features a faux drawer design that pulls out another standard twin bed. The honey wood finish will remind you of log cabins and campfires. We love to stage this piece with bold bedding patterns for kids. Complete your kid’s bedroom set with an inexpensive bed that looks luxurious. 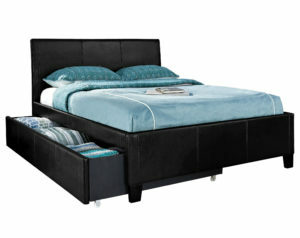 Leather and synthetic leather bed frames are a wise investment for kids’ beds that you want to last through teen years. The New York Black Trundle Bed is one of our top picks. The simple square shape and dark stitching throughout the synthetic leather make the piece look and feel a little bit more grown up. Parent Pro Tip: Explain the benefits of having a big kid bed to your growing child! They’ll be excited to show off their mature new bedroom set to all your visiting family and friends. Velvet beds for kids are this season’s hottest children’s bedroom accessory. The glamorous Gabby Bed is bright magenta with diamond tufted upholstery. The pure white bed bun feet and rolled crown top headboard add extra elegance to this bed. We love velvet because it’s a cozy fabric. Your child will love the combination of soft pillows and blankets with a comfortable headboard. This set comes in twin and full-size bed options. Learn about a similar style, the Stanton Padded Bed, here. It’s important to spend your money wisely when you’re shopping for beds for kids. Not only do you want your child to love their brand-new bed, you want to make sure it’s built to last. Here are some tips for investing in kids twin and full-size beds. A sturdy wood or metal frame is essential for your child’s safety while they sleep. We recommend asking your salesperson about the materials of every bed frame you’re considering. Knowing exactly what each bed is made of will help you decide what meets your standards for safety and durability. Pro tip: If you want a lightweight frame, opt for metal. If you want a sturdier frame, choose wood. Perhaps the best way to test out your new kid bed is to try the model at your local American Freight Furniture and Mattress. Sit on the bed and touch the framework to understand how the components fit together. Whether the bed comes with built-in storage or a reversible staircase, you need to be familiar with the entire bed. If you have a little one who needs their first post-crib bed, you might consider a twin bed. Twin beds save space, yet give your child plenty of space to grow into. If your child seems to be growing every time you turn around, perhaps a full-size bed would be a better option. The key is to find a bed size that’s appropriate for the size of your room and the height of your child. We recommend shopping for a bed your child can grow into or use for several years. Complete your child’s bed set with a soft and supportive new mattress. We have standard and luxurious mattress options and everything in between. For small sleepers who overheat, we love the Simmons Silver Lagoon Mist Plush Twin Mattress. For a soft cushion that won’t compromise support, choose the Dream Sleep Twin Mattress. 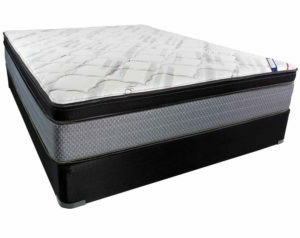 Try before you buy when you visit American Freight for any size mattress. American Freight Furniture and Mattress offers every day low prices on living room furniture, dining sets, bedroom sets, and mattresses. It’s always a great time to stop in and browse our latest selection. We also offer low easy payments and free layaway for all our products. Ask about our same-day delivery for all in-stock items. To find an American Freight Furniture and Mattress store near you, click here.